Welcome to the seventieth (#17) dividend income report, covering earnings I've made from dividend-paying stocks, peer to peer lending (both fiat and cryptocurrencies) in September 2018. In case you are wondering why I'm sharing online my earnings - the answer is pretty simple - I like transparency and these reports help me to observe my progress or bounces. Hopefully, my reports can give some inspiration to you as well. (If so, please leave a short comment below) Also, I have a goal to reach one million dollars in my bank account by the time I will turn 60 (27 years still to go). 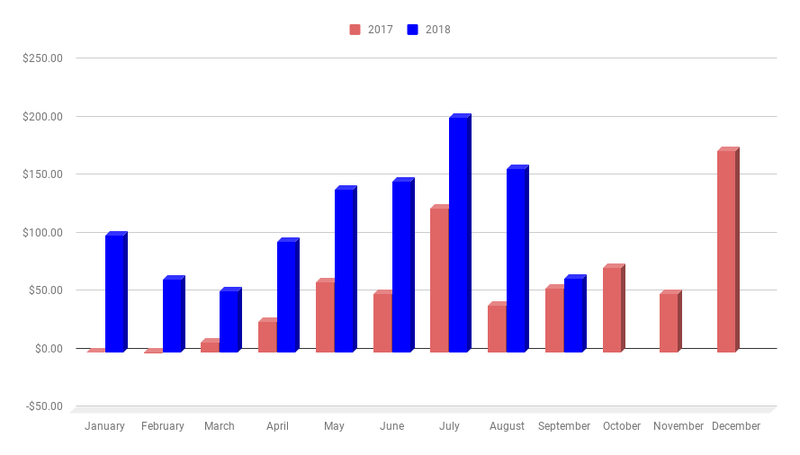 Last September turned worst than expected - mostly because I didn't receive two dividend payments, on the other hand, I will receive them in October, which will boost this year October dividend income report. In total there were 5 great companies paying me us dividends in September, that's 2 more if compared to the previous September. The YoY growth rate for my dividend income in September is 16.25%. That's just USD 8.97 more than a year ago. I'll take it, as long as there is growth. On the average, I should pull about $58.25 each month for the next 3 months to reach my $1200 goal for 2018. Should be easy. A year from now I'm looking for a minimum of $110 dividend income in September 2018. Wait, for the first time this year, I actually didn't reach my goal. It hurts, but I will take it, sometimes you are not achieving your goals, not a problem. When setting goal/forecast for September 2019 I will take that in an account and will set a more humble $120 goal for next year. Let me say it loud - another boring month, but that's how it works, step by step, month after month, and hopefully, by the time I will turn 60 it will be a large snowball already giving financial freedom to me and my family.